How often do you use your dry erase board in the office? Probably pretty frequently, depending on your needs, projects and other factors. In our minds these boards are only a tool for work, explaining the details or visualizing the algorithms for a concept-in-progress application. Office life may get boring and turn into routine over time and there’s a great need to find something relaxing and recharging within the walls of your workplace. But let’s leave these details to Human Resource managers and Event Managers, they know their job better than we do. But what if we could use that plain and obscure board in a way that nobody expects? And certainly in a way that won’t leave anyone indifferent. We came up with 8 creative office whiteboard ideas to make the daily routine a tiny bit brighter. Some you may find obvious and uninteresting (kudos for creativity! ), but we’ll try to impress you and give some fresh food for thoughts. We love optimizing our time and efforts! Ever had this weird thing when genius idea slips away from your mind while you’re looking for some place to write it down? Well, what if instead of getting up from the workplace and crossing the room to make some notes, you could do it straight away? Whiteboard table is the answer. Unleash your creativity or write down the action plan right after it comes to your mind. Then, gather your team around the table and explain/discuss every aspect. This time you managed to write it down in time! And it would be awesome to feel yourself like King Arthur and the Knights of the Round Table (square table does it as well). Planning to make something like that at home? The kids will love it! Some people don’t like brainstorming because it puts pressure on them and the generated ideas are often too conservative and contain absolutely no novelty. We can combine basic psychology and a small dry erase board into a powerful creative engine without applying any mental difficulties on the dedicated team. Leave the general task at the top of the board and encourage the co-workers to add their ideas anytime. They can write it down or use a sticker. Ideas come in the most unexpected times, so there’s no need to limit yourself (unless you’re burning the last deadline). Give it some time, then discuss the results and choose the best idea. When working on a large and complex project it’s important to keep yourself (and the team) motivated and switch the focus from “how long has this dragged on” to “how far have we come”. Pictures capture your emotions forever and you can use it to boost morale. Start making photos of everything you do and everything you feel about it. Stick it on the memory whiteboard, bingo. When months pass and last bugs are getting fixed, you can all reflect on your journey together, develop a closer bond and realize that you have made it all through together. Common memories can turn even the greatest enemy into the most loyal friend. This wall can become your legacy that you pass on through years of growth, prosperity and hardships. Ever heard of Reddit’s The Place? It was a blank space where everyone could paint pixels into some color, eventually creating a masterpiece. From chaos to collective work towards a piece of art, this can become the feature of your office. Stretch the board across any spare wall and let it live its own life. 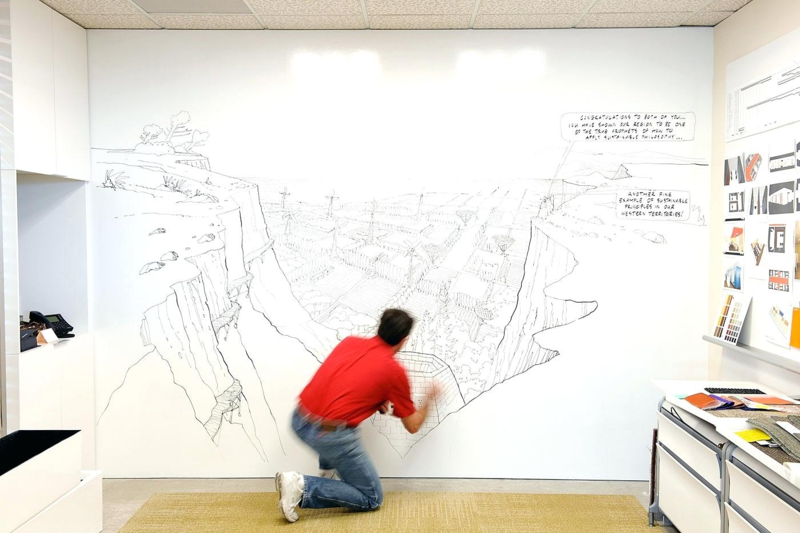 Creative people who can draw will amaze with their skills and the bunch of others may try to conquer the wall with two-stick little humans hunting a mammoth. It’s just one of a billion of scenarios, but that’s why the charm is so good. First, random drawings will pop up, but as the time passes, you will get a fully-designed wall of unique art that belongs to your team. It may look chaotic and unaesthetic, but it’s something that you’ve done together. Remember that it’s the journey that bonds people, not just the destination. We’ve managed to find an awesome example of this on candd.co. This has no specific purpose and depends on you and your teammates only. Whether it be Thankful Thursday or Independence Day or any other large holiday, let people write down congratulations, wishes, thoughts and so on. A full wall of stickers that express gratitude, love and appreciation can be the best spirit lifter that one can imagine. Organize a coffee evening reading the wishes out loud and voicing your feelings, fear-free. Birthday parties are also a nice time to use the dry erase board in such way. Ask everyone to attach stickers with wishes, fun facts, photos or anything else that your creativity gives birth to. Sense of togetherness and good mood is guaranteed hands down. Competitions are fun. And those that challenge one’s brain are even better! Whiteboard can become a gaming warfare zone. Make a Sudoku template, for example, to test the brain skills of the team and let them have a distraction from pressing matters, if need be. Or use magnet chess and start a tournament with the whole crew being the spectators! Possibilities are only limited by your imagination and willingness to explore new areas. You can leave the final game as the part of huge art on your wall sized whiteboard as an eternal memory of the first champion. This would turn your office into something that only a few individuals have ever seen. This one is inspired by the Cicada 3301 puzzle and the craze that surrounds it to this day. All interactive fun is awesome in the office and the whiteboard will surely help you to freshen the moods a tiny bit. Create a cipher and leave a message suggesting the next moves. This could be a very creative way to present an important announcement. You can try to congratulate the team on an important milestone that nobody else knows about yet. This dry board idea certainly requires a bit more effort than usual, but the engagement and the rewards are much higher as well. You can turn a quiet office into a house of murmurs, discussions and deciphering geniuses. Work process can be frustrating and annoying; negative energy needs to be spent somewhere and this dry erase board idea may direct it into the needed direction while turning everything into a good laugh. Let coworkers leave anonymous stickers about the stuff that annoyed them the most - the board will be covered with fun complaints. Create a contest and choose the best one at the end of the month! Good laugh and positive energy will be there. This may also hint to bigger problems within the company and would allow quicker solution based on internal experience of those who are directly involved in the process. Anonymous feedback is always the most honest one, thus extremely useful. Another use for the whiteboard to explore the unknown skills of your co-workers - collective poetry! Writing board is an awesome place for collective work and composing a poem together may be one of the best ideas. Start with writing down a single line and let everyone continue. Some time later you will get a hilarious rhymed text that may even become your unofficial company anthem (if you like it). As you see, the whiteboards in your office are not only a tool of improving workflow and building concepts. It is also a nice way to enhance the collective atmosphere of the team and to boost the sense of togetherness. The most effective team is the one with common jokes, common goals and shared memories. This is exactly the effect you can get while using the whiteboard in an unexpected way. One of the possible side effects - astonishing pieces of written or visual art that may remain on the walls for years, reminding everyone what have you achieved together. We sincerely hope that this bunch of ideas will appeal to you and you’d decide to implement some of the tricks in your office, or even home to build the next level of positive atmosphere. And such ideas could be comprehensively implemented and supported in forward with dedicated team, like InveritaSoft custom web development company.